Would his son ever forgive him? The question nagged at Blake Carmichael as he climbed the stairs to bed. If the evening they’d just spent together was any indication, the answer was a resounding no. They’d decorated the Christmas tree, and Eli hadn’t said ten words the entire time. He was only staying until his mom, Blake’s ex-wife, returned from her honeymoon. Blake had two weeks to convince his teenage son to trust him again. 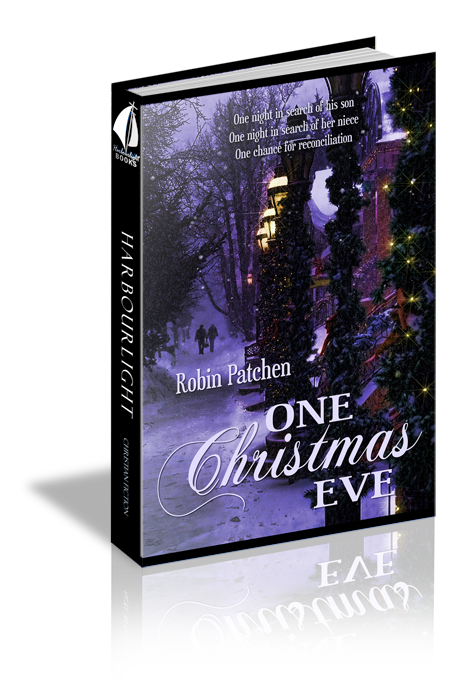 From the upstairs landing, he glanced at the twinkling lights on the Christmas tree below, and sighed. He better not blow this chance. He walked, not towards his own room, but to Eli’s. The few times his son had stayed overnight, Blake had sneaked into his room to pray by his bedside. If Eli woke up and found him there, he’d be furious, but Blake couldn’t resist looking at his son’s face void of the scowl normally looking back. He listened outside Eli’s closed door. Aside from the gentle hum of the heater and the distant sound of the surf crashing against the rocky New Hampshire shore, he heard nothing. He cracked the door. In the moon’s glow seeping through the window, Blake saw Eli’s things scattered on the floor—the jeans he’d worn that day, his suitcase with a couple of T-shirts hanging out, and his school backpack. Beyond the clutter, the queen-sized bed was covered in a messy disarray of blankets, beneath which lay his teenage son. Blake tiptoed to the bed, sidestepping the clutter. Not even a tuft of his son’s dirty blonde hair stuck out from beneath the comforter. He walked around the bed to see if his son’s face was showing from the other side, but again, all he saw was the blanket. He gently lifted the comforter, but instead of his son’s gangly limbs and messy hair, he saw the plump edge of a pillow. He tugged the comforter back another few inches. Pillows and blankets. He pulled the sheets back. More pillows. Heart pounding, he yanked the covers off the bed entirely. Three pillows were lined end-to-end on the otherwise empty bed. He opened the bathroom door and flipped on the light. Empty. Blake stood in the center of his son’s room, shocked and muttering incoherent prayers. Then he bolted out of the room, down the stairs, and into his office. Disconnecting his cell phone from its charger, he dialed Eli’s number. It went straight to voicemail. Blake dropped the phone on the desk, resisting the urge to throw it against the wall. Instead, he opened his laptop, navigated to his email program, and scrolled down to his ex-wife Amber’s message from two days before. Yes! Halfway down the page was the name and phone number of Eli’s best friend. He dialed. “Hello?” said a groggy female voice. “Mrs. Bishop?” Blake ran out of the study and up the stairs. Blake unzipped the backpack while he waited. Slowly he pulled out the contents. A three-ring binder, at least a dozen pencils, most with dull or broken tips, a handful of crumpled pages. An old math test—Eli got an A-minus. Two faded red erasers. While he searched the backpack, music filtered through the phone, louder by the second. Either Hayden slept with music blaring or he was still awake. “Here he is,” Mrs. Bishop said. Blake felt his temper roll in like the surf outside. He blew out a breath and prayed for patience. “Yes. It’s unforgiveable.” He let the words hang in space, hoping Hayden would take pity on him. Seconds ticked away while the silence expanded. Blake left his number and hung up, knowing he wouldn’t be hearing from Hayden Bishop again, whether Eli called him, or not. Kelsey Waters. Kelsey Waters. Why was the name familiar? Then he remembered. He’d met Kelsey the previous spring, right after he’d started attending Seaview Bible Church. She was attending that Sunday with her aunt, Tallia Waters. Tallia. Beautiful woman, at least ten years younger than he, with dark brown hair, milky white skin, and captivating green eyes that spoke of innocence and wisdom, all at the same time. He’d wanted to ask her out, but he refused to start any new relationships until he had mended fences with his son, a self-imposed punishment for all his bad behavior. But if he was going to start dating again, Tallia would be on the top of his list. He grabbed Eli’s backpack and ran down the stairs to his office again. The church directory would have Tallia’s phone number. He could get Kelsey’s phone number from her. He dialed the phone. He was out of breath from the stairs, the fear, or maybe a combination of both. Heavy breathing. An excellent way to start a middle-of-the-night conversation with a beautiful woman. Though Eli had turned sixteen and earned his driver’s license, he didn’t have a car, yet. Amber didn’t want him to have that much freedom, since he’d been flirting with trouble for a few years. He knew part of Amber’s reluctance was a fear that Eli might actually be grateful to his father for the gift. Blake was pretty sure Amber would hate that. However, Blake had decided a new car would be a great Christmas gift for Eli, now that he’d had his license for six months and had proven his competence and responsibility. The dealership was delivering the Mustang convertible the next day, Christmas Eve, to surprise Eli Christmas morning. Was it too late to get his money back? “Blake?” Tallia’s voice was suddenly high-pitched.